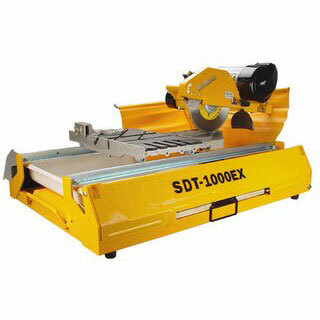 The SawMaster SDT-1000EX is a wet tile & stone saw intended for flooring professional jobs. This tile saw was designed from the beginning to cope with the challenges of handling oversized materials. Both, a wider cutting table and longer frame have allowed this saw to cut tiles up to 24" straight and 16" diagonally. The tile&stone saw incorporates numerous features that allow it to excel at its role, including a swiveling cutting head which can be tilted 45° to permit miter cuts without requiring additional tools. This model, like all latest generation EX tile saws, includes a built-in toolbox, a retractable workbench, and wheels for operation convenience and ease in transportation. Ask our tile & stone saw specialist for more information.